Sterling Apartment Homes is positioned perfectly in Logan Square, a neighborhood that offers one of the most sophisticated and affordable urban lifestyles anywhere. 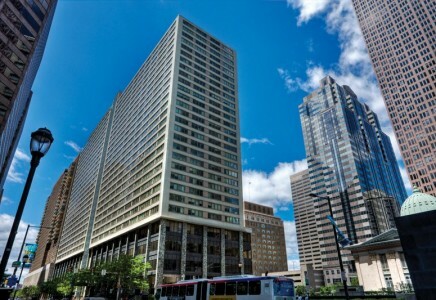 Situated between Broad Street to the east, the Schuylkill River to the west, Market Street to the south and Spring Garden Street to the north, the Sterling Apartment Homes are located within walking distance to many of Philadelphia’s cultural attractions. Whether you’re looking to experience the natural beauty of the tree-lined Benjamin Franklin Parkway which leads to iconic Philadelphia institutions such as the Barnes Foundation and the Philadelphia Museum of Art, the serenity of the Schuylkill River Trail, or the shopping and dining that Rittenhouse Square has to offer, the Sterling places you in close proximity to the center of Philadelphia’s business and cultural districts. The Sterling’s residential units feature wood flooring, granite countertops, GE clean steel appliances, and maple cabinets. The building boasts a brand new tech lounge with free Wi-Fi and USB ports throughout, as well as a 24-hour concierge. Building amenities include a rooftop swimming pool, a rooftop social deck with lounge seating, free WiFi, flat-screen TVs and a gas fireplace surrounded by glass windscreens. Residents will enjoy an updated fitness center with 1500 extra square feet, new LifeFitness equipment with personal TVs, and larger windows with views of Center City. The Sterling’s central location provides easy access to Suburban Station commuter rail, I-676, I-76, I-476 and I-95, the convenience of being just 10 miles from Philadelphia International Airport, and the benefit of living close to Center City Philadelphia’s business district. Let the James ‘Right’ Price team’s real estate acumen find your new Philadelphia luxury condominium in The Sterling to call home today!